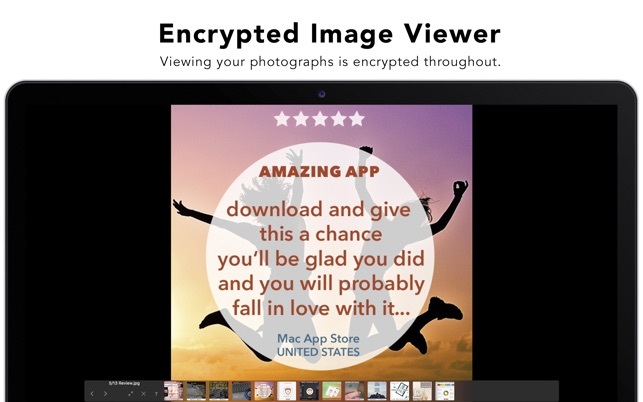 SimpleumSafe - strong and continuous encryption, easy-to-use - best next generation encryption app. Nowadays it is not enough “only” to encrypt your data to be protected. If you want to view, edit or organize the encrypted files, they also must be protected. SimpleumSafe goes a different way than most other encryption programs. After authorization with a password, the files are not provided in the file system. Otherwise they would be completely vulnerable from this moment on. SimpleumSafe makes its own file system and has its own finder. Thus the files remain encrypted for the entire time. * Strong encryption with AES-256. 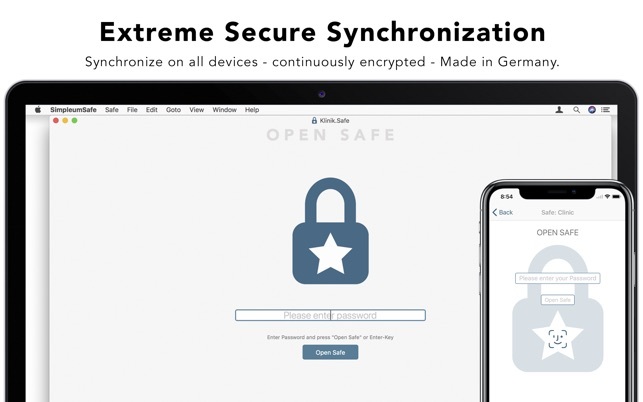 SimpleumSafe was developed with Extreme Secure Synchronization - continuously encrypted. Even if the synchronization data was stolen from the cloud and the password became public, it is not possible to decrypt the data. No hidden costs and subscription models: with SimpleumSafe for Mac you pay for your security once! Thank you for using SimpleumSafe! For an optimal app experience we update SimpleumSafe regularly. 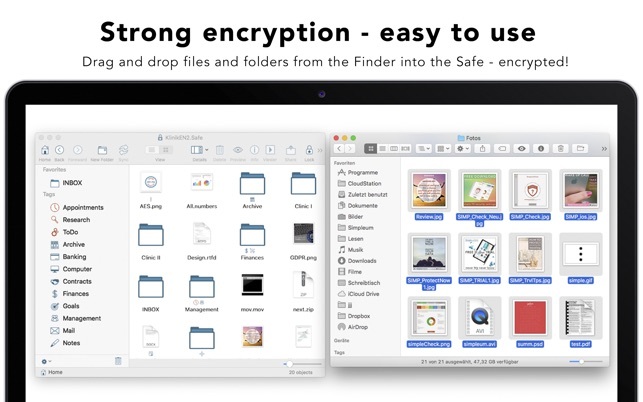 I’ve tried many encryption programs over the years, but nothing compairs to Simpleum Safe for keeping encrypted information on the cloud, i.e. iCloud, or Dropbox. If you create a safe on the iCloud account you can sync with the iPhone iOS app. I have safes on both iCloud and Dropbox. SimpleumSafe creates a temp drive when in launches as to not use the local file system when viewing files within your safe. This is one of the best thought out and written encryption security programs I have ever seen. Very easy to use with lots of options such as taging files and attaching icons to the tags.. i.e. photos, documents, etc. Down load and give this a chance you’ll be glad you did and you will probably fall in love with it. Always use difficult to guess passwords for your safe. Password123 is an example of a weak password… Fred!23s$%tR is an example of a password which won’t be broken easily. Not too much more to say. Clear, intuitive, simple interface. Secure enough for us mortals. Does what it says it does without elaborate, useless bells and whistles. 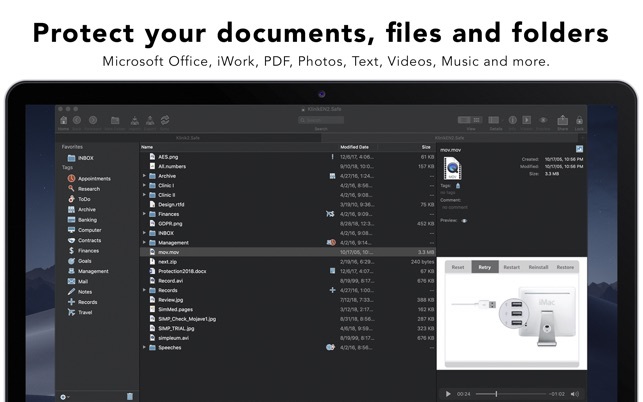 Documents can be uploaded to Google Drive and then downloaded and opened, edited, etc. if app is on the receiving Mac computer. Cheap insurance to keep my launch codes - and my credit card numbers - secret and readily available when I travel. Secured documents are not in the computer's file system, they are in SimpleumSafe’s own file system in its own Finder. Searching the computer’s file system provides nothing; you must search in the SimpleumSafe’s file systems. And for that you need the password. Works well for me. Initially, I had some trouble with opening the application but I received quick and helpful support from customer support. Now that I'm able to use it, it has been helpful with being able to keep documents secure. It's also nice to be able to edit documents, which is an issue with other encryption programs. I highly recommend this app. The price is worth it.